L: 30" x W: 32.5" x H: 41.5"
Wimberley Accent Chair Simultaneously classic and chic, the Wimberley accent chair makes a gorgeous addition to your living space. Its timeless look takes a traditional wingback chair design and updates it with track arms and tapered feet for a stunning transitional look. Polished nailheads provide the perfect finishing touch to this beautifully tailored piece. Simultaneously classic and chic, the Wimberley accent chair makes a gorgeous addition to your living space. Its timeless look takes a traditional wingback chair design and updates it with track arms and tapered feet for a stunning transitional look. Polished nailheads provide the perfect finishing touch to this beautifully tailored piece. This chair is simple and fits into the rest of my living room. When it arrived it was initially higher than I had experienced in the store, so that my feet actually couldn't reach the floor! However, it's settling, and more comfortable now, but with the help of a cushion or footstool. I think this will gradually fix itself. Most important for me is the excellent support this chair gives me for my back and seat--not a chair to sink into, fall asleep in, and then struggle to get out of. Doesn't need a cushion for the back. I feel comfortably alert sitting in it. Easy to get out of it without holding on to the arms of the chair. If you are looking for a nicely firm chair, this is the one for you. Love the look and comfort. Hoping to buy a new living room and bedroom set. The service all through this purchase, I was never pressured. My saleswoman went over and above making me comfortable, I was in a major car accident only a week prior. I will definitely be back soon. This is the most comfortable chair I've sat in for a long time. Good, firm back and bottom support. Very good sales and service support throughout purchase process. I tried at least three different stores and about dozen chairs. 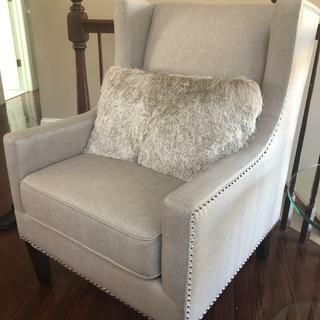 I picked Wimberley Accent Chair because it was very comfortable. More over service by Amir was just great. Great chair. Matches both formal and informal space. Purchase process always easy and painless with R&F. Beautiful design with quality fabrics. We simply love it???? I love my chairs in my bedroom. Beautifully perfect with the Hollywood loft bedroom set! Comfortable chair. Small damage on the side. Picked it up in store. Overall a beautiful chair. 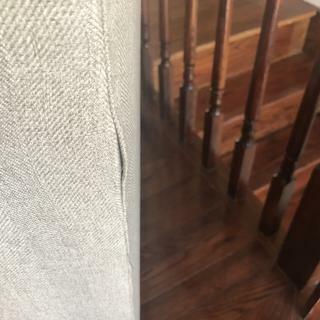 Will contact the store about the small damage. Hello, what color is this chair? I see that there are two colors available, one is dark gray, but what color is this, the light chair? The lighter color chair (Belem Pebble) is a light taupe. Is there a matching ottoman that goes with this? BEST ANSWER: Hi Megan, thank you for your interest in the Wimberley Accent Chair. Unfortunately, this chair does not have a matching ottoman. If you are placing this in a room with other neutral furniture or leather furniture it might be nice to introduce some pattern. I have attached an option for an ottoman below. Also, you can pair with a leather ottoman which would showcase the richness of the chair. You are able to order a swatch of fabric for most of the stocked upholstery items should you want to see the fabrics together before purchasing. What color is Belem Pebble on the Wimberley chair? 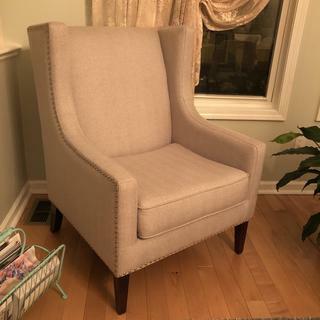 Can this chair be ordered without the nailhead trim? BEST ANSWER: The Wimberley Accent Chair is not available without the nailhead trim. BEST ANSWER: The Wimberley is not made in the USA. Can you get this chair in other fabrics?